It used to not even be a question. When it came to meat, I’d always choose pork shoulder over the pork tenderloin or a chicken thigh or leg over a boneless, skinless chicken breast. Then I started to brine these leaner cuts and the decision became a lot more complicated. Brining refers to soaking meat in a salt water mixture for a set amount of time to yield a more flavorful and juicy cooked product. Sugar is often added to the mix as well as aromatics such as herbs and garlic and flavored liquids like tea, cider or beer. As far as culinary techniques go, it’s fairly simple: you make your brine, add the meat, and refrigerate before cooking as directed in your recipe. It’s straightforward, but there are two ways things can go off track for the cook. The first mistake happens at the store. Don’t purchase meat or poultry that is either self-basting and/or has had a saline solution added to it. If you buy meat or poultry with any of these words on the label, don’t brine them. Salt has already been added to the meat during processing and brining will make your end product way too salty. You can also have a problem with your meat being too salty if you brine too long. There’s a tendency to think that if one hour of marinating makes something delicious then 2 hours will be even better. That’s just not the case with brining. Always pay attention to the suggested brining times in recipes; brining too long makes things too salty, and conversely, brining for too short of time won’t do much at all. 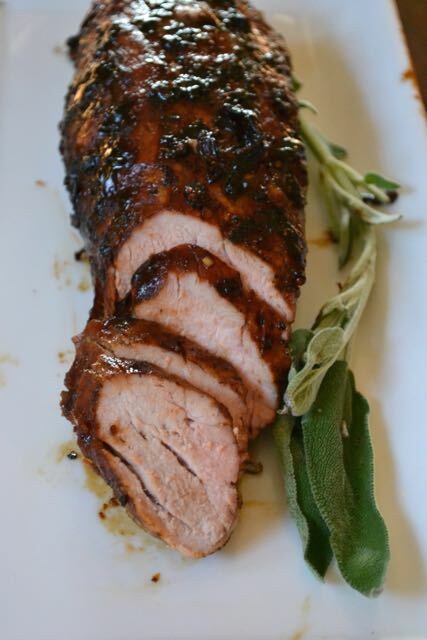 The orange-chipotle glaze in this recipe not only imbibes this pork tenderloin with a subtle smoky-citrus flavor, but also gives it its spectacular mahogany color. I typically encourage cooks not to mess with food as it’s grilling, but when you have sugar in a glaze or marinade I find it is helpful to turn meats more often to prevent too much charring. While a little char is a good thing, too much is a bitter, bitter thing indeed. If using a grill pan, feel free to partially cook the meat and then put it in a 375 degree oven to finish cooking if your pan starts smoking too much. Nothing kills fun in the kitchen like a blaring fire alarm. Before slicing for serving, be sure to let the meat rest. While brining does a lot to guarantee a moist final product, allowing the meat to rest for 8 to 10 minutes before slicing makes this dish that much more juicy. If you used a grill pan, things are looking pretty dismal for the dishwasher right now. So instead of drooling over your tenderloin while it rests, be nice to the person who cleans the pots and pans. Return the grill pan to medium-high heat and carefully add some water to the pan. Use a wooden spoon to scrape up any bits stuck to the bottom as the water bubbles and boils. Once you’ve thoroughly scrape the pan, dump out the water in the sink and see the smile return to your dishwasher’s face. I always have a can of chipotles in adobo in my pantry. I love adding the chilies to sauces, marinades, and hearty stews and use the vinegary sauce to add subtle smokiness in recipes like this one. Trim excess fat and the silverskin off the tenderloin. Combine the water, salt, brown sugar, smashed garlic clove, and sage in a medium saucepan. Bring to a boil and stir until the sugar and salt completely dissolve. Remove from the heat and add the fresh orange juice. Let cool to room temperature. Combine the tenderloin and brine in a Ziploc bag or large bowl. Cover and refrigerate for at least 45 minutes and up to 3 hours. While the pork is brining, combine the orange zest, minced garlic and freshly ground black pepper in a small bowl and set aside. In another small bowl, combine the orange marmalade and water and stir to combine. Stir in the adobo sauce and set aside as well. Heat a grill or grill pan over medium heat. Once hot, lightly brush the grill or grill pan with vegetable oil. Remove the pork tenderloin from the brine and pat it dry with a paper towel. Rub the zest and garlic mixture over the pork tenderloin and then place the tenderloin on the grill. 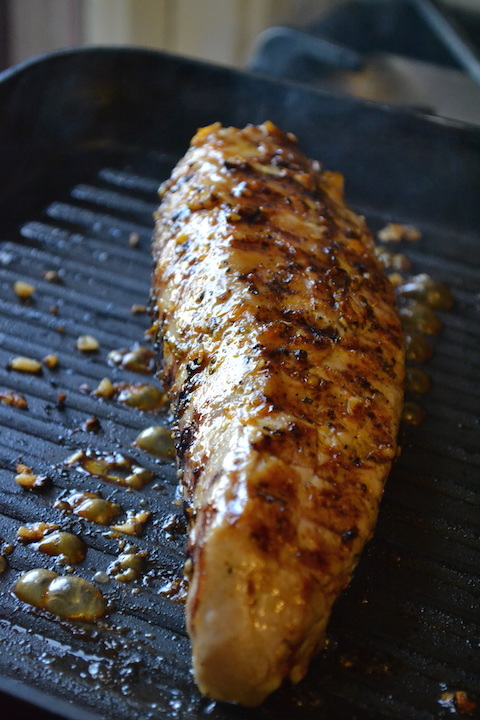 Grill for about 20 minutes, turning as needed, until the pork tenderloin reaches an internal temperature of 145 degrees F. Begin brushing with the glaze after 12 minutes; at this point, it may be necessary to turn the tenderloin more frequently to keep the tenderloin from charring too much. Turning every couple minutes, be sure to brush frequently with the glaze to get plenty of flavor and that beautiful mahogany color. 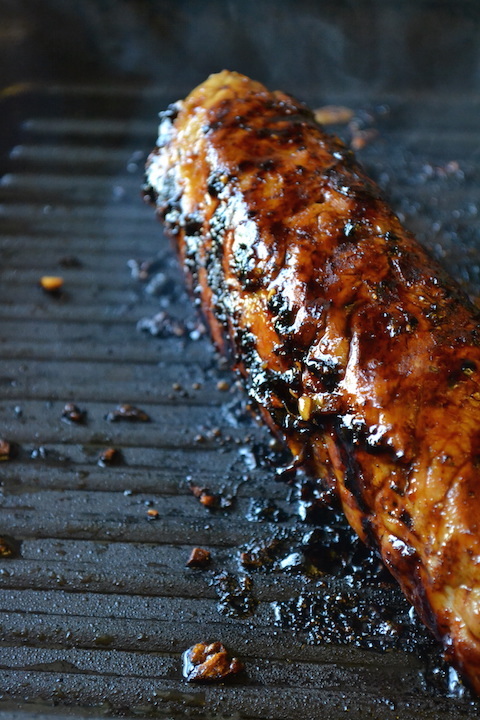 Remove the pork from the grill and set it on a cutting board. Cover with foil and let rest for 10 minutes. Slice the pork into 1-inch slices and serve immediately.